And it's called hard work. Hard work beats talent all the time. For every extremely talented person who is getting on with minimal effort you will find a much less talented fellow who is doing much better by working his bottom off. Hard work beats talent all of the time. And if you are fortunate to be extremely talented and extremely hardworking, you have won a life lottery. You can have all the talent in the world but if you don't put some hard work into it, a guy with no talent but with just hard work will do better than you. In fact, when we say nothing is impossible we mean to achieve anything all it takes is just hard work and untiring dedication. Three years ago I was not a talented writer. And today I'm still not a talented writer. But if you took what I wrote three years ago and compared it to what I wrote three months ago you would notice the huge improvement, a somewhat miraculous one. The only natural talent I have is reading. There has never been a point in my life where I struggled to read, it was not a skill I acquired while growing up; it's more like a skill I was born with. Every other skill I acquired through hard work. I now brush my teeth better with my left hand, in fact, it's like I have always brushed with my left hand. And this is a skill I forced myself to acquire in 2010/2011. My impressive arithmetic skill is the product of several beatings at school and at home, till I became so good that I owed my good graduating result to the lots of Maths in the electrical electronics engineering courses. Now I can do the seemingly impossible with Microsoft Excel using the regular formulas regular Excel users know. I have no natural talent in Excel just hard work carved skill. Hard work in itself can make up for any lack: lack of talent, lack of resources, lack of luck and lack of beauty. Because hard work itself is a form of talent that generates its own resources, creates its own luck and have its own beauty. There is something always charming about the hardworking. People find inspiration in the success and riches built on hard work than one built on talent or inheritance. And best of all, anyone can be hard working. There is no entry barrier. In fact, challenges only make its acquisition easier, not harder. And once again, a hard working woman/man is never disadvantaged. 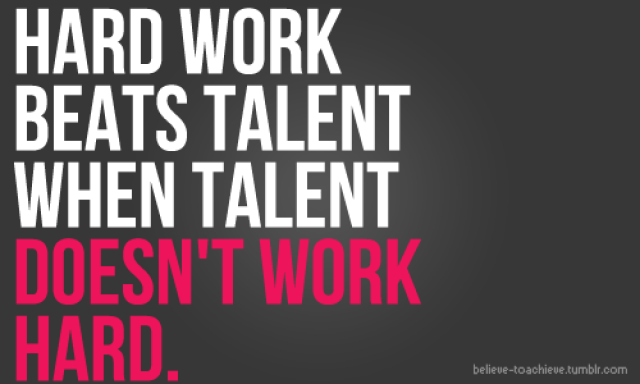 Because hard work beats talent all the time.